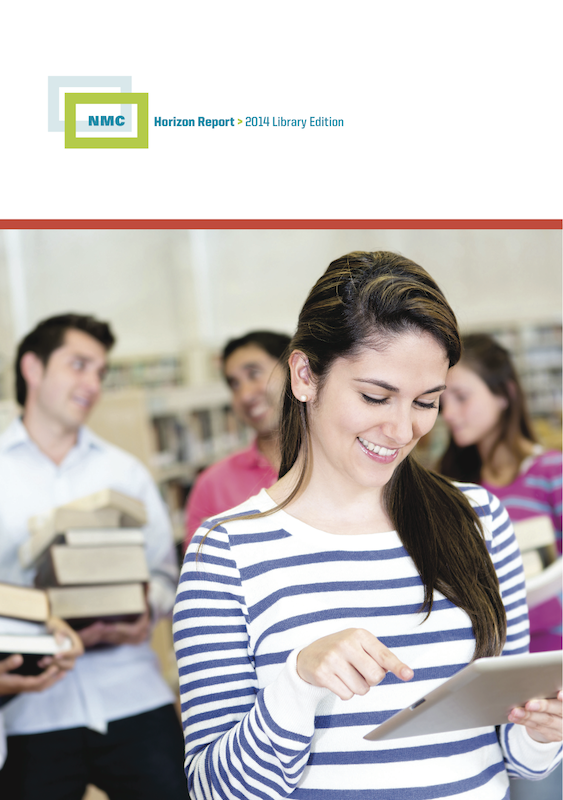 The NMC Horizon Report: 2014 Library Edition, examines key trends, significant challenges, and emerging technologies for their potential impact on academic and research libraries worldwide. While there are many local factors affecting libraries, there are also issues that transcend regional boundaries and common questions; it was with these questions in mind that this report was created. The NMC Horizon Report: 2014 Library Edition was produced by the NMC in collaboration with University of Applied Sciences (HTW) Chur, Technische Informationsbibliothek (TIB) Hannover, and ETH-Bibliothek Zurich. Johnson, L., Adams Becker, S., Estrada, V. & Freeman, A. (2014). NMC Horizon Report: 2014 Library Edition . Austin, Texas: The New Media Consortium. Retrieved April 19, 2019 from https://www.learntechlib.org/p/148442/.